Governor Ayodele Fayose of Ekiti State has declared that he would reorganise the Economic and Financial Crimes Commission (EFCC) if he becomes the country’s president. He made the pledge when the detained Commissioner for Finance, Mr. Toyin Ojo and the state Accountant General, Mrs. Yemisi Owolabi, were released by the EFCC on Wednesday. 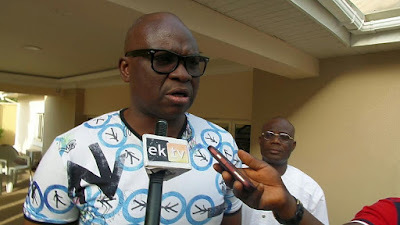 Fayose, who declared a half-work day, said the commission had turned to an agent of oppression, adding that he would never beg the anti-graft agency, which he called a ‘senseless’ organisation. He promised to buy new cars for the two officials in appreciation of their loyalty to the state.“They said Sambo Dasuki stole $2 billion, but they have stolen $25 billion from the NNPC and the presidency is defending it,” he said. Meanwhile, Ojo disclosed that the EFCC could not produce any evidence against them, adding that they were practically begged to leave the detention.The Speaker of the House of Assembly, Kola Oluwawole and the Chairman of the Nigeria Labour Congress (NLC), Ade Adesanmi, alleged that the EFCC was still planning to arrest more officials.